The full moon of March takes charge of the evening sky tonight, but Jupiter, Venus, Mars and other solar system objects are putting on a show for stargazers as well. March's full moon peaked at 4:39 a.m. EST (0939 GMT) this morning (March 8), though the bright moon generally appears full to casual observers both a day before and after the exact time of its full phase. This month's full moon is usually called the Lenten Moon, but it goes by many other names as well. In Algonquian, for example, it's known as the Worm Moon, a reference to the softening soils of spring that make wriggling worms available to birds returning from their wintering grounds. "Other names are Crow Moon, Crust Moon, Sugar Moon, Sap Moon, Chaste Moon, and Death Moon," explained astronomer Geoff Gaherty of Starry Night Software. "In Hindi it is known as Basanta Purnima or Dol Purnima." This sky map shows the locations of planets Jupiter, Venus and Mercury in the evening sky just after sunset on March 8, 2012 to observers at mid-northern latitudes. But the moon isn't the only skywatching show on offer tonight. Jupiter and Venus, for example, are drawing closer and closer together in the sky, on their way toward a rare conjunction on March 15. For the next few days, Mercury will join them, visible a bit lower in the sky. Skywatchers with binoculars may even be able to see Uranus just below Mercury, and the dwarf planet Ceres — the largest object in the main asteroid belt between Mars and Jupiter — nearby. The sky maps of the full moon and planets accompanying this story show where and when some of the night's most interesting skywatching targets will appear. Observers at higher latitudes may also be treated to a dazzling display of the auroras, also known as the northern and southern lights. An intense solar storm erupted Tuesday (March 6), sending billions of tons of solar plasma streaking into space. These particles have begun hitting Earth's atmosphere already, and they should cause supercharged auroras close to our planet's poles. All of this skywatching activity comes on the heels of another celestial treat. The closest approach of Mars in more than two years occurred Monday (March 5), when the Red Planet approached within 62.6 million miles (100.7 million kilometers) of Earth. The milestone occurs once every 26 months, which is the time it takes Mars to complete a single trip around the sun. This sky map shows the position of Mars and the full moon of March as they appear on March 8, 2012 at 8 p.m. local time to observers at mid-northern latitudes. 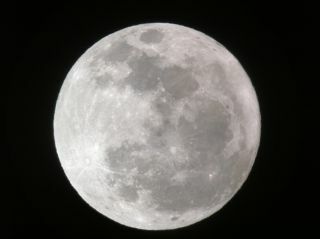 "Sixty-three million miles never seemed so close," skywatcher Andrew Kwon told SPACE.com after observing the event. Kwon used a small telescope to capture stunning view of Mars that revealed the planet's northern ice cap and other surface features. Because of its relative closeness, Mars is currently shining extremely bright and offers a dazzling target for skywatchers. You can find Mars tonight appearing bright reddish-orange above the full moon. The Red Planet has come much nearer in the past, however. In 2003, Mars came within 34.8 million miles (56 million km) of our planet — the closest the two planets have been in almost 60,000 years. If you snap an amazing photo of the moon, Mars, Venus, Jupiter or any other skywatching target, and would like to share it for a possible story or image gallery, please contact SPACE.com managing editor Tariq Malik at tmalik@space.com. You can follow SPACE.com senior writer Mike Wall on Twitter: @michaeldwall. Managing Editor Tariq Malik (@tariqjmalik) contributed to this story. Follow SPACE.com for the latest in space science and exploration news on Twitter @Spacedotcom and on Facebook.